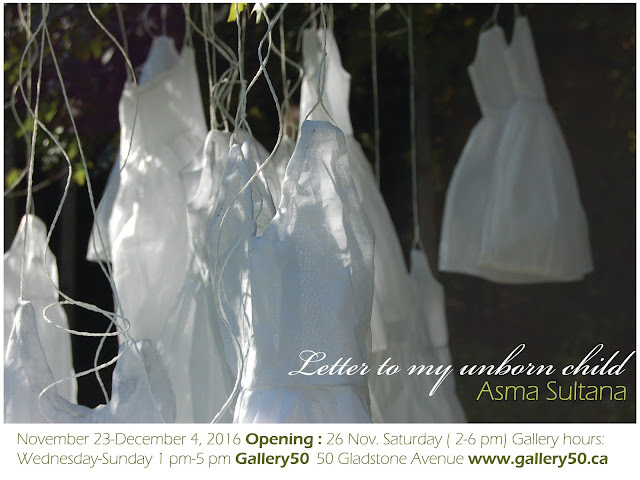 Letter to my unborn child, an exhibition organized by Gallery50 features twenty-eight of the recent works by artist Asma Sultana. Autobiographical and personal in its nature, she collected her own uprooted hair over several years and uses as the thread to fashion baby dress and made embroideries symbolizing her life experiences. Like the biological children she never had, her artworks are like her own child growing outside her body nourished by love, dream, hope, and imagination. It is her way of communication with her unborn child through her art. They narrate her loss, displacement, abandonment, pain and struggle of an exile in search of the identity, to her imaginary unborn child. In the almost tangible intimacy of her works, one can also identify our mysterious need to unburden our feelings to someone who is also a part of us. Asma Sultana is a Bangladeshi born British freelance visual artist, currently living and working in Canada. After Bachelor in Drawings and Paintings from Bangladesh, she was trained in London and Toronto in Fine Arts and Art History. As a freelance artist, Asma organized several solo exhibitions and participated in many group exhibitions in Canada, England, India, and Bangladesh. She uses the unique signature of her body to explore the identity in time and place. With the tip of her fingers, using her own hair and footprints, she imprints her emotions to canvas or papers or fabrics to express the inimitable chaos of her inner and outer world. Her works are included in many private collections all over the world.